This sophisticated analysis will interest Holocaust and Jewish studies scholars. 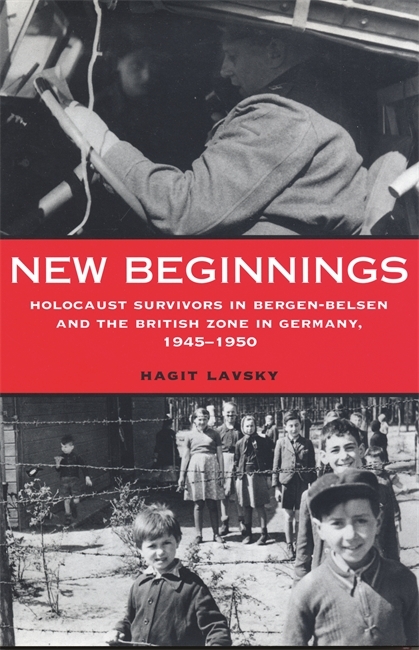 New Beginnings offers an unprecedented historical inquiry into how Jews in Germany began to rebuild their social and cultural networks immediately following World War II. Lavsky concentrates on the British Zone of occupation in northwest Germany, where some of the most important Jewish communities developed and laid the foundation for a central Jewish organization in the Federal German Republic. It was here, through a unique cooperation of "camp and community," that a new Jewish post-Holocaust nationalism began to take shape. As the first in-depth analysis of the combined development of "camp and community," New Beginnings examines the history of both groups within the context of the Jewish world, the emergence of Palestine-Israel, and the international arena. In so doing, it reveals that the Jewish presence in Germany was not only an issue to be tackled by external powers but also an active force shaping the Jewish post-Holocaust stance worldwide. Hagit Lavsky teaches at the Hebrew University, where she is the Samuel L. and Perry Haber Chair for Post-Holocaust Studies and Director of the Cherrick Center for the Study of Zionism, the Yishuv, and the State of Israel. Lavsky's detailed and compelling work meticulously reveals the complexity of the postwar situation and shows how broader social, economic, and political contexts affected postwar Jewish life. This sophisticated analysis will interest Holocaust and Jewish studies scholars. Professor Lavsky dispels prevalent ideas of a passive group of survivors and has returned agency and autonomy to this unique community of survivors. It is no exaggeration to say that this is a pathbreaking study.